Compunetix is proud to announce that President and CEO Dr. Giorgio Coraluppi and a select team of company executives will be in attendance at this year’s EY Strategic Growth Forum in Palm Springs, CA on November 11 – 15. Dr. Coraluppi was named Ernst & Young’s Master Entrepreneur 2015 for Western Pennsylvania and West Virginia, making him eligible to participate in the national event with Entrepreneur Award winners from 28 regions across the country. This year’s Forum kicks off with a host of keynote luminaries from the consumer products, life sciences, manufacturing and technology industries, and includes celebrity hosts such as Julia Louis-Dreyfus and Seth Meyers, host of Late Night with Seth Myers. CEOs attend this event to supercharge company growth, learn the latest on the strategic transaction marketplace and available capital, meet potential customers, investors, partners, acquisition targets, and buyers, and hear inspiring success stories from game-changing entrepreneurs. For nearly 30 years, the EY Entrepreneur of the Year program has recognized the endeavors of exceptional women and men who create the products and services that keep our worldwide economy moving forward. Since its inception, Entrepreneur Of the Year has grown dramatically and now includes programs in more than 140 cities and in more than 60 countries worldwide. 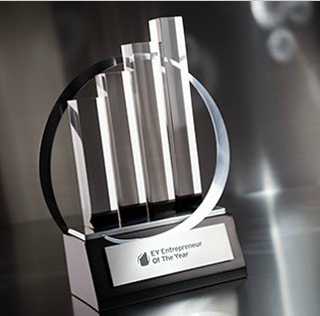 For more information on the EY Entrepreneur of the Year awards, click here. Best of luck to Dr. Coraluppi!